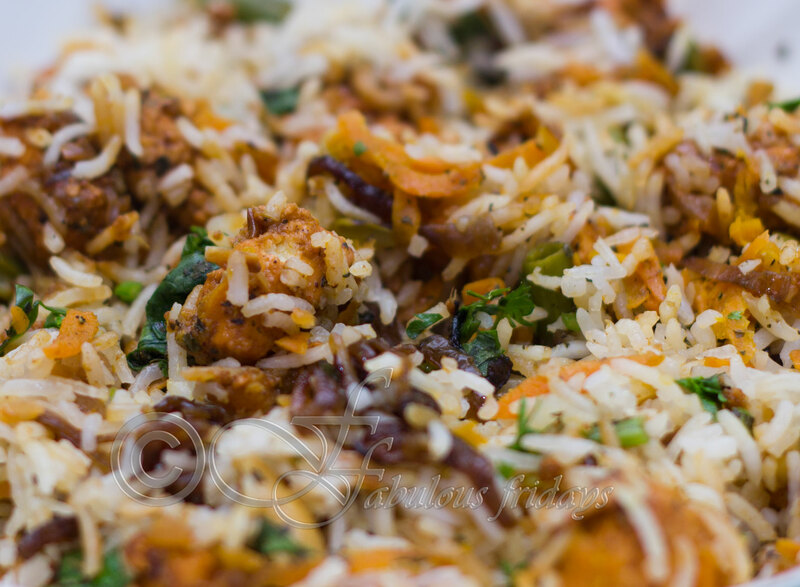 Some of the vegetarian readers of my blog have requested the recipe for a vegatarian version of biryani. The procedure is a little bit different but the ingredients and spices are very similar. Use any vegatable you desire for this recipe. Sometimes I use frozen mixed veges. If you omit the cottage cheese this could be suitable for vegan cuisine. Substitute tofu or cooked drained beans instead. In a large pan heat oil and lightly fry cubed paneer till golden brown. Keep aside. In the remaining oil add all the dry spices and let them spatter for 30 seconds. Add onion ginger and garlic and fry till it turns golden brown. Add rice and fry lightly for 1 minute. Add all the vegetables along with the ground spices and salt and fry for 2-5 minutes till everything is well infused with all the spices. Add water and saffron and give a stir to mix well. Cover and monitor till it comes to a rolling boil. Then simmer covered for 10 minutes till rice is almost done. Add the fried paneer and mix. take the pan off heat and cover, let stand for 2-5 minutes. Sweet and sour chicken balls make a wonderful appetizer, dinner item or just a snack. Serve these over plain rice or noodles for dinner, or pile high in a plate with toothpics for a party starter. This dish is a great hit with kids and adults alike. Make sure you have a large quantity, as these mini delights go fast. The sweetness of honey with the tartness of vinegar together with garlic, soy sauce and hot sauce the flavours blend in very well. You can make the chicken balls and freeze for upto 6 months. To use simply defrost and cook in the sauce and serve. Can use gound turkey, lamb or beef for this recipe. Mix all the ingredients for chicken balls together and shape into 1 inch balls. Deep fry or bake at 375 for 15-20 minutes till brown and cooked through. Keep aside. In a saucepan mix all the ingredients for the sauce and bring to boil. Stir in the chicken balls and cook till the syrup is bubbly and clear for about 4-5 minutes. 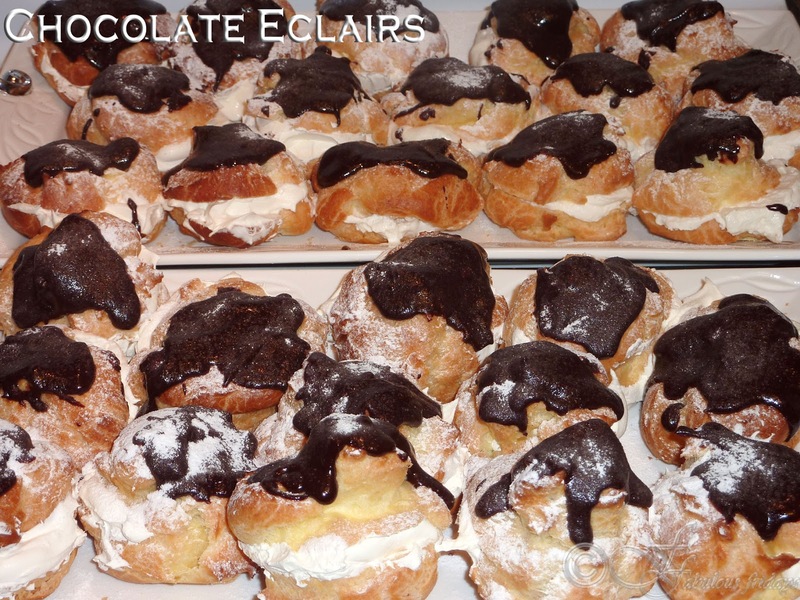 Eclair au chocolat... a magnificent dessert and a delightful French classic. A concoction of choux pastry with a filling of whipped cream and chocolate glaze topping, every bit delicious. This is my valentines dessert this year. Happy Valentines day everyone. In a saucepan, combine butter, water and salt over medium heat and bring to boil stirring constantly. On boil remove from heat and stir in all the flour to make a smooth batter. Return to heat and cook stirring constantly until the mixture leaves the side of the pan. Remove from heat and cool the mixture completely before adding eggs. Beat in the eggs one at a time. Make sure each egg is fully mixed before adding the next. It should make a stiff enough dough to pipe. Fill up the dough into a piping bag with 1/2 inch nozzle. On a cookie sheet lined with parchment paper, pipe this mixture in the desired shape. Make 4 inch long eclairs or small round cream puffs. Bake at 425 F for 10 minutes till they are well risen. Lower the oven temperature to 350 F and continue baking for another 15 minutes till completely dry. These should be completely firm when taken out of the oven, or they will collapse. When they are completely cool, use a sharp knife to slit the horizontally and pipe in whipped cream. Spread chocolate glaze on top of each and give a dusting of powdered sugar. Add salt and sugar and stir for a minute until smooth. Use it while its still spreadable. If it starts to set, heat it a bit. Basant Panchmi meaning the fifth day of spring is celebrated throughout India to mark the end of winter. This day is dedicated to goddess Saraswati who showers the wealth of knowledge. To welcome spring the color yellow plays an important role. 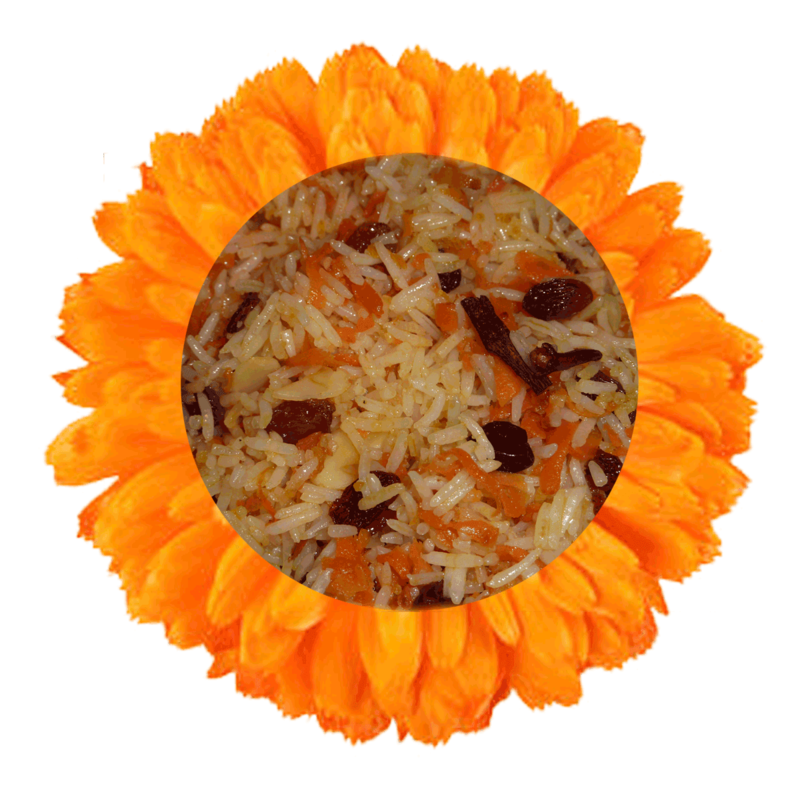 Everyone wears yellow colored clothes, offer yellow flowers and make yellow food colored with kesar (saffron). The fields are covered with mustard crop and its yellow flowers spread a radiance of gold all over, enhanced by the golden rays of sun. Since childhood I remember this day as the yellow day and also as the day when we had meethe chawal or sweet saffron rice. Now every year I make them on this day so that my girls become a part of this beautiful and simple ritual. So here goes my version of this dish. Happy Basant Panchami everyone. In a large pan heat oil and ghee, add cloves and cinnamon. Add the raisins, almonds and grated carrot. Stir for 3-4 minutes till carrots become a bit tender. Now add the rice and saffron and mix well. 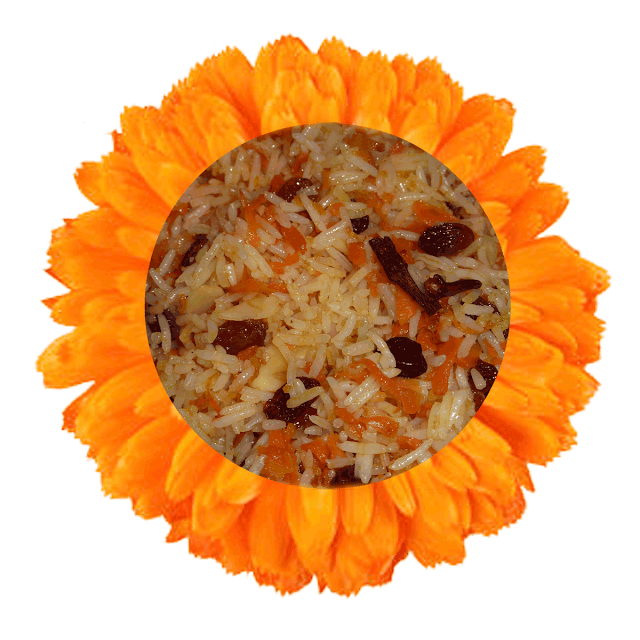 You will see the beautiful golden color in the rice from the saffron and carrots. On medium heat stir for about 3-4 minutes till all the flavours blend together. Take out all the seeds from the green cardamom and crush into fine powder. Add sugar and cardamom powder along with almond extract and mix for 1-2 minutes till the sugar blends with the rice. It takes a while to prepare and requires many ingredients but its worth the effort. A one dish meal with every food group. Lasagna is a classic pasta casserole dish with layers of pasta, cheese and sauce. 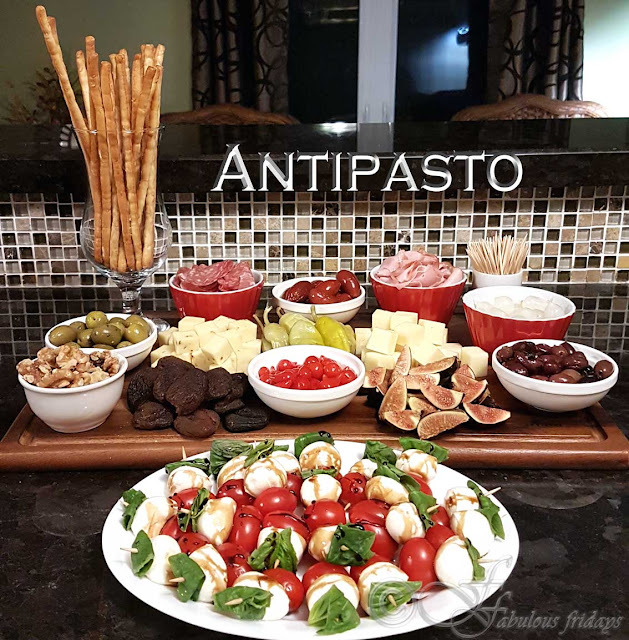 Many variations exist depending on the type of sauce and cheese being used and if it contains meat and or vegetables. I am posting this recipe for a friend of mine. I haven't seen her in over 14 years, yet she still remembers the lasagna I made once as I do her biryani. Since then my version for this recipe has changed hopefully for the better. Add ground chicken/lamb and vegetables(for meat sauce) or only the vegetables(for vegetarian version). Cook on high stirring often for about 2-4 minutes till chicken cooks a bit. To assemble the casserole take a deep rectangular baking dish and grease it. Spread 2 cups of tomato sauce at the base evenly. 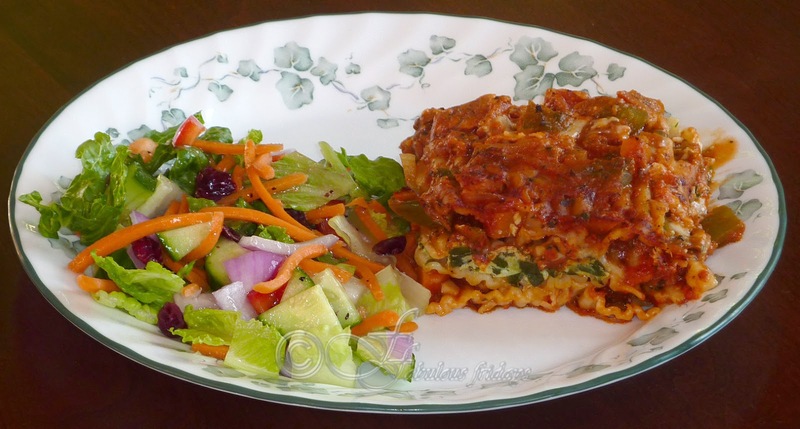 Layer lasagna noodles on top without overlapping since they will expand on cooking. Spread half the cheese sauce evenly over the noodles. Top with another layer of lasagna noodles. Now spread 2 cups of tomato sauce evenly covering all the noodles. The moisture from the tomato sauce will cook the noodles. Sprinkle with half the shredded cheese evenly. Arrange another layer of lasagna noodles, followed by cheese sauce, followed by lasagna noodles , followed by tomato sauce, followed by the final layer of shredded cheese. Cover with foil and bake at 350F for 35-40 min till everything is bubbling in there and noodles are cooked. Remove the foil and bake for another 10 minutes to brown the cheese. I usually serve this with a salad.